Alexander Börve’s company FirstDerm offers online consultations with board-certified dermatologists and a free product that uses AI to give users ideas about what their skin condition might be. But Börve’s background isn’t in dermatology. In fact he’s an orthopedic surgeon by training. He had the idea to build his app because he realized how pervasive the need is for dermatological consultation. If people will show their moles to a stranger at a dinner party, a stranger on the internet doesn’t seem like a big stretch. And Börve isn’t the only one who thinks so. Since the beginning of health apps, there have been products designed to tell the user if a mole is cancerous. But those apps have also served to illustrate the dangers of mobile health. Two such apps, Mel App and Mole Detective, were the target of action by the Federal Trade Commission in 2015. In early conversations about FDA regulation of mobile health, mole apps were the go-to example for an app that presented a mortal danger. If an app told someone a mole was low risk and it turned out to be cancerous, shouldn’t the FDA have regulated that app, Congressman Henry Waxman asked the FDA in a 2013 Congressional Hearing. But none of that has stopped developers from tackling the space. We catalogued some of the storied history of apps claiming to detect skin cancer just last year when Doctor Hazel, another such company, participated in a TechCrunch hackathon with a claim of 90-percent-accurate skin cancer detection. In 2018, dermatology is still considered a prime area for digital health intervention, as evidenced by the recent formation of a $1 million Advancing Innovation in Dermatology Accelerator Fund, a joint non-profit venture by LEO Pharma and Advancing Innovation in Dermatology. Although a number of apps of dubious legitimacy are still flooding the app store, the field has proved both an extremely promising one technically and a challenging one to monetize. The biggest areas of interest today are around teledermatology and AI for cancer detection, but innovators see other technologies, including augmented reality, as possible use cases for the future. When a user visits FirstDerm’s website or opens an app, they can upload a picture of their skin condition and a short description without paying a dime. It’s only at the end of the process that they’re offered the chance to pay between $29 and $59, depending on expediency, to send those photos to a dermatologist for analysis. But Börve says that very few do. What most casual users of dermatology services want is reassurance, Börve said, but it’s not worth a large out-of-pocket payment. FirstDerm has about $900,000 from angel investors and accelerators, but has accepted no venture capital. That’s why, Börve says, they’ve survived in the direct-to-consumer space while most of their competitors have had to pivot into B2B. Direct-to-consumer teledermatology can be profitable, but it’s too slow a return for VCs to show much interest. Michael Sierra, vice president of LEO Science and Tech Hub, echoed those sentiments when talking about why they decided to launch their new accelerator. In the meantime, other companies are seeking better business models for teledermatology. Telederm UK, which works with the NHS, offers its services to primary care physicians, who can photograph a skin condition in the office with a dermatoscope and send it to Telederm’s experts. Working through doctors is not only an easier business, it potentially yields better results according to Maria Charalambides, a University of Birmingham researcher who recently conducted a literature review on dermatology apps in collaboration with the British Association of Dermatologists. Going through alternate payers is not a perfect solution either, Börve said, as many employers and insurers either want a more holistic telemedicine solution or are more focused on chronic conditions like diabetes or cardiovascular disease, which make up a much larger portion of their costs. An app doesn’t have to tell a user whether they have cancer to be useful in dermatology care. Apps can go a long way towards solving a problem that has long plagued the space: accurately measuring moles and lesions, as well as tracking their change over time. “There are apps that literally just function as photo storage,” Charalambides said. “So every month they can give you a notification to take that photo of the mole that’s worrying you and you can kind of have a photo diary every month of the mole so you can see how much has changed. Technology can help replace a standard of care in dermatology that’s currently about as low-tech as it can be. Healthy.io, a company that currently uses the smartphone camera for urinanalysis and wound care, has hung back from the dermatology space for a number of reasons. But his company is trying to solve similar measurement problems in wound care. In the clinic and at home, smartphone cameras and computer vision can start to address these problems. At WWDC this year, Apple debuted an app that would use augmented reality to accurately measure three-dimensional objects. This technology could be useful for mole tracking, Ju said. Sierra, from LEO Pharma, thinks AR could have other applications as well. That technology could also help educate patients on what skin should look like when it’s healing, to give them confidence in their treatments. In February 2017, the cover story in Nature displayed a smartphone screen, on it a mole, a red square, and a label: melanoma. Inside, a groundbreaking work from Stanford University showed that a convolutional neural network trained on 129,450 clinical images could go head to head with 21 board-certified dermatologists when it came to distinguishing between a benign mole and a malignant melanoma. Since then, academics and private companies alike have been trying to commercialize that technology, bringing the cancer-detecting mole app closer than it’s ever been. But as well as showing what’s possible, the Stanford study showed what was required: lots and lots of robust data. There are a lot of reasons good data is hard to find. One problem is there’s a lot of noise in skin images. In one case study on First Derm’s website, a user submitted a photo of red splotching, but the AI focused instead on a mole that happened to be in the picture. Ironically, the splotching turned out to be likely nothing, but the mole registered as potentially cancerous. Similarly, it’s important to train any network on people of different races and skin tones, to make sure the tool works equally well for all potential users. Another problem is that clinical images like the publicly available ones used in Stanford’s study were taken in a clinical setting and won’t necessarily be similar enough to ones taken on people’s smartphones to be an effective training tool. There is no public database of smartphone images, but companies like First Derm have a good idea of how to build one. That’s one reason why First Derm collects the images first and then asks users to pay. “When we come to the payment screen we’ve already captured their images,” Börve said. “So since these images are anonymous and also our terms and conditions say we can use it for research and to make the service better, we can use these for machine learning. So we have dermatologists that analyze these images and we use them for machine learning. Börve thinks that dataset is the real gold mine his company is sitting on. He used the analogy of Google Maps. His hope is to license an API out to general purpose telemedicine companies like Teladoc, which will then be able to offer First Derm-powered AI dermatology in their own apps. Börve said First Derm has a head start because most AI researchers are focusing on a binary output: cancer or not cancer. 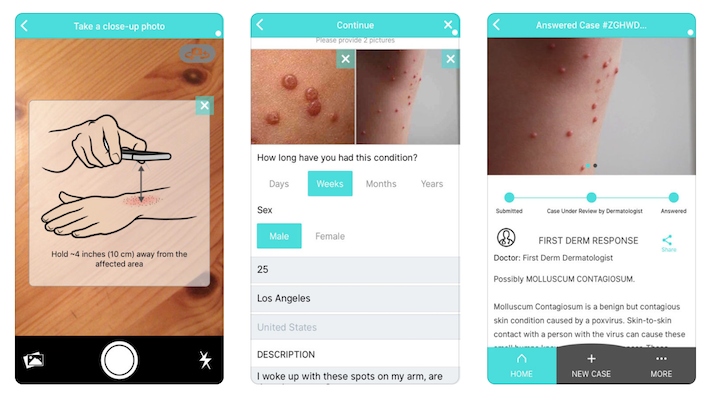 First Derm is looking to use AI to tell users what they have, whether it’s acne or eczema. But while such AI is undoubtedly getting better — Panetta thinks the technology is only a year away from commercialization — its public perception hasn’t moved much since 2013. Charalambides’ lit review points to a huge number of dubious apps on the app store promising to deliver melanoma risk levels. She, and the British Association of Dermatologists, are warning consumers away from those apps until there’s some way to regulate them. Even well-meaning apps — designed, like First Derm, to build up enough data to train a network — deal with the false negative problem. That’s something Panetta is thinking about as she prepares to build a similar app.